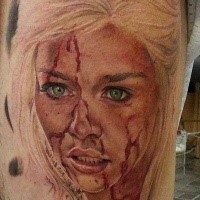 Dragon Tattoo is a classic tattoo which is popular both with men and women. 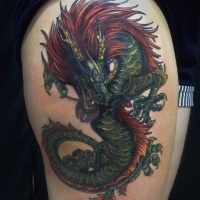 A dragon on tattoo shows that Chinese and Japanese cultures have been greatly influencing tattooing in western countries for almost two centuries. 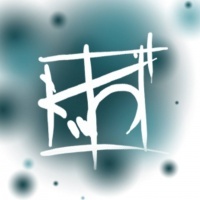 In the East the dragon symbolizes the four elements – the Earth, the Wind, the Fire and the Water and the four corners of the Earth – the East, the West, the North and the South. 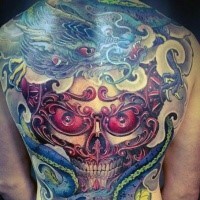 It is at the same time a symbol of water, the sky, the earth and the underworld. Dragons have been known all through the ages. These giant, winged, fire-breathing creatures resemble prehistoric animals ‒ dinosaurs that existed on our planet millions of years ago. The dragon, however, appeared due to people's imagination. The fact of its appearance may be explained by the fossils of dinosaurs and other giant reptiles that have been found not only in China but in other parts of the world too. Different peoples had completely opposite dragon symbols. In China, for instance, these mythological characters were symbols of the supernatural and the imperial power. As the dragon was the god of rain, it was often depicted around the approaching storm clouds. Dragons got implanted in the legends and myths of Chinese culture so much that they were even considered to be the forefathers of the Chinese people. One of the Japanese emperors once declared that he was a descendent of one of the dragons, that was immortal and the most powerful of all. No wonder we can see pictures of dragons on the Japanese emperors’ clothes which symbolize the power of the emperor and the protection on the part of the dragons. 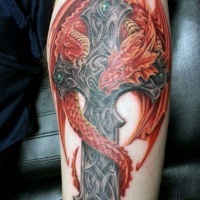 As it has been mentioned, the dragon represents the four elements and it is from here that different myths about the supremacy of dragons in the air, water, fire and on the earth originate. Dragons of each of these elements have their own peculiarities. For the Chinese people the dragon breathing fire was primarily associated with lightning, thunder and rain and was a symbol of fertility. Dragons of the water were considered to be defenders and they also acted as guardians of streams,rivers, lakes and even private pools. In addition to the dragons, which represented the four elements, there are myths and legends about specific dragons. 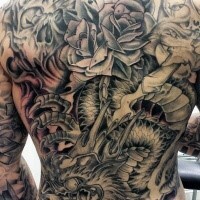 For example, there are mentionings of the dragons guarding treasures or serving to somebody. In Japanese and Chinese cultures there also exist a lot of stories about different creatures which turned into dragons after long journeys. In Japan, for example, people used to tell stories about carps or Koi fish which having made a dangerous arduous journey turned into dragons. The dragon had played a major role in folk beliefs of such countries as Japan and China, as well as in the ancient Chinese religion of Taoism before the Buddhist era. In the ninth century the Chinese dragon appeared in Buddhist art, where he played the role of Buddha’s protector and watched over the sacred laws of Buddhism. Its image could be found on the doors of the temples and gravestones, which was supposed to protect these sacred places from evil spirits. The best-known images of dragons appeared in the ninth century and they were made in ink. These dragons had long, scaly bodies, small horns, paws with claws, large eyes under bushy eyebrows and sharp teeth. A wingless dragon symbolized the rainbow. In the West dragons uniquely expressed evil. They were associated with the Serpent from Eden which turned out to be a source of trouble for the whole humanity. Later there were descriptions of battles of some Christian saints with fire-breathing dragons, for example, Saint Michael battled with such creature. You can find pictures of the famous battle of the patron saint of England St. George with a sea dragon, in which the saint is portrayed as an obvious winner. 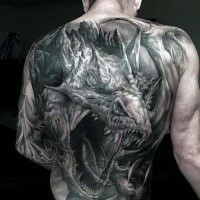 In Greek and Roman civilizations the warriors wore dragon images during battles as a symbol of terror. Images of dragons were pictured on Viking ships. The Celtic dragon was a symbol of sovereignty. The Anglo-Saxons depicted it according to their own standards. 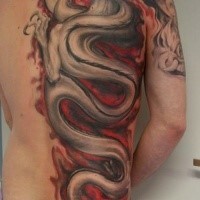 Nowadays the Red Dragon is the national symbol of Wales. Wherever the dragon appeared, its supreme power and authority were used either as a defense or as an evil force that must be defeated. To gain a victory over the fire-breathing dragon was considered the highest criterion of human courage and endurance. There are numerous legends about the heroes of ancient Greece, who fought with dragons. Today we can see different images of dragons, showing their different aspects: protective, heavenly or monstrous. According to Chinese astrology people who are born under the sign of the Dragon will be leaders in their lives. According to Feng Shui if you place coins with dragon images, symbolizing the Yen, along with coins with the image of a phoenix which is in charge of family welfare and symbolizes the Yin energy, you can reach heavenly heights. 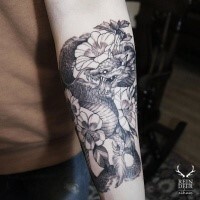 What concerns Dragon tattoo it symbolizes nobility, magic, the strength of transformation and imagination, loyalty, perseverance and ability to go beyond the usual. 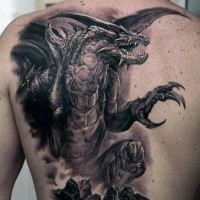 Dragon tattoo is more often chosen by people as a symbol of strength and power. 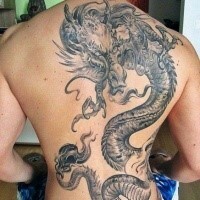 The dragon is also a symbol of the spiritual and supernatural qualities. The dragons are among the most noted mythological beasts in the world. 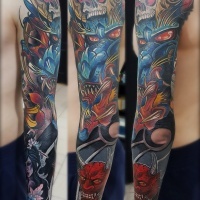 One more thing that makes dragon tattoos so attractive to people is their rich bright colors and bold designs. There is a wide variety of ways of depicting the dragon that is why you can easily make your own creative drawings. 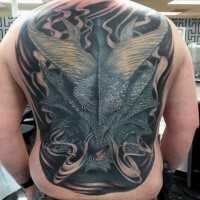 There are two types of dragon tattoo designs which are used more often. The first is the Western dragon with a thick scaly body, wings, which look like the wings of a bat, and a long neck. And the second design is the East Dragon without wings whose body looks like the body of a snake. 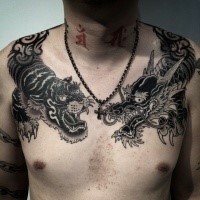 The Western dragon is popular thanks to different mythological stories about it, and not because it has any deep sense. However, sometimes they do have a deeper sense. 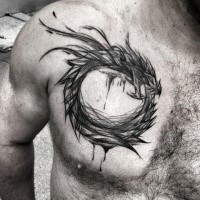 For example, the Celtic Dragon "the circle of life" is meant to represent the cyclicity of life. They may also be used to express pride in their historical roots. Let's take, for example, the national symbol of the Welsh the Red Dragon. What concerns the Eastern dragons, they are much more than just giant snake-like creatures. 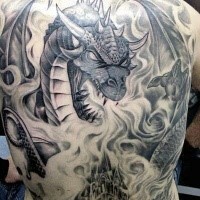 These dragons symbolize various elements, such as the Fire, the Wind, the Earth and the Water. They are neither good nor evil themselves, but they often represent the natural forces which can be both good and cruel. 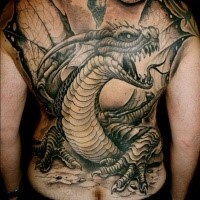 It should be noted that most dragon tattoos are bright and in different colours. But they can also be made only in black colour or in various shades of grey. 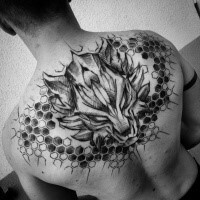 The combination of black and red is also a splendid fulfilment of this tattoo, which is more often used in tribal tattooing. Taking into consideration the volatile nature of dragons, it is possible to create different scenes and depict different creatures in them. 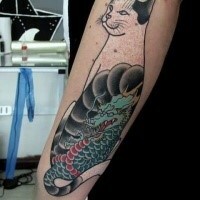 We can refer to the design of the dragon Koi fish. They say that the Koi fish, which is a symbol of masculinity, wisdom and longevity, rises up to the top of the waterfalls and at the end of its journey turns into a dragon. You can get a simple drawing which will show the creature that resembles both a fish and a dragon. And you can make a more complex picture which will show the gradual transformation of a fish into an animal. 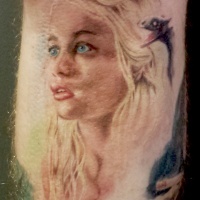 As for the background in these tattoos, it can be as diverse as the dragons themselves are. 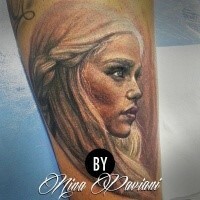 You can use, for instance, the image of the flame, flowers or other things: a medieval fortress emerging from a cave, a mountain or a colorful sky. 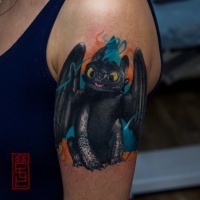 Black or in color, applied on a small area of the body or taking a much larger part ‒ regardless of its design, dragon tattoo symbolizes nobility, power, magic and superiority over the ordinary. 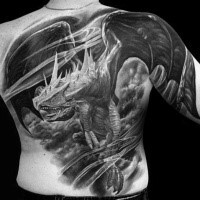 People often use dragon tattoos to express their thoughts about themselves, or their desire to see themselves strong and free.